Working Lunch: NuVegan Cafe | Food and Drink | Style Weekly - Richmond, VA local news, arts, and events. Scott Elmquist The chick ’n’ drummies at NuVegan Cafe may be meatless, but they crunch and shred like real fried chicken. Weekday lunches have to work hard. Monday you need quick takeout, Tuesday you're hosting an important client meeting, Thursday you're taking the laptop somewhere quiet with free coffee refills, and Friday maybe you're just looking to try something new. Our Working Lunch column aims to help readers find their own go-to spots for such goals. To start, we checked out trendy NuVegan Cafe on East Grace Street. 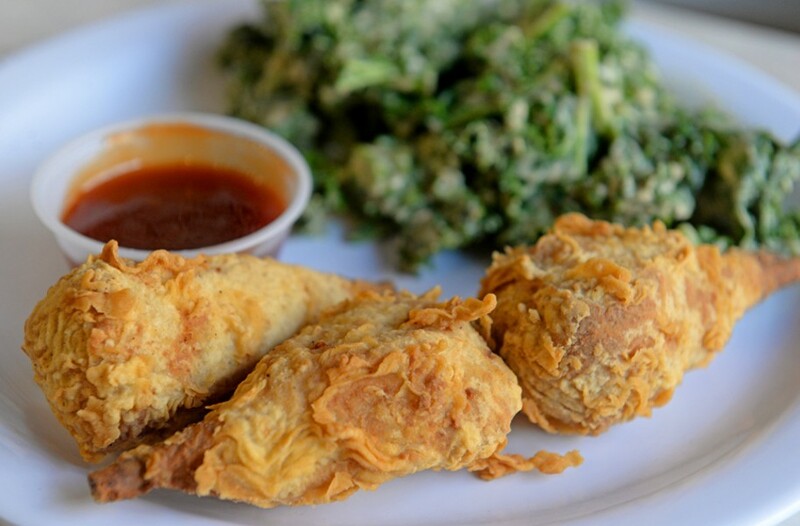 It's the first franchise for this Washington-based vegan soul food concept. 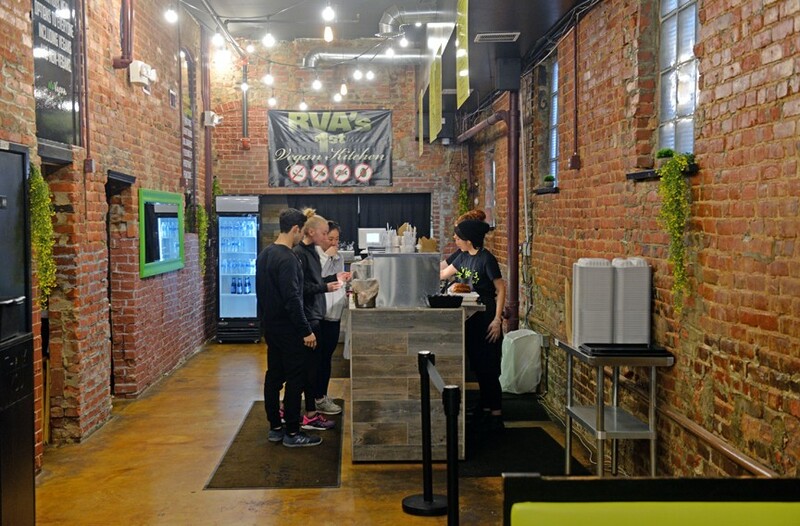 NuVegan offers a long list of daily hot and cold specials, sandwiches and a fresh juice and smoothie bar, but how does it stack up for a weekday lunch destination? NuVegan attracts a lunch crowd of downtown workers, with a mix of eat-in and takeout patrons. The stripped-down decor features exposed brick walls, wood accents and a mural with words like "soulful, "wellness" and "energy" that emphasize the health-conscious intent. The dark melamine-topped tables and worn chairs give the space a fast-food feel, but this spot doesn't have the attentive efficiency of a Panera or Starbucks. The food is the reason to visit NuVegan. It's 100 percent vegan, and not even omnivores will leave hungry. The extensive menu includes substantial dishes like a vegan cheeseburger, fish-free fish sandwich, grilled quesadilla and a raw veggie wrap. 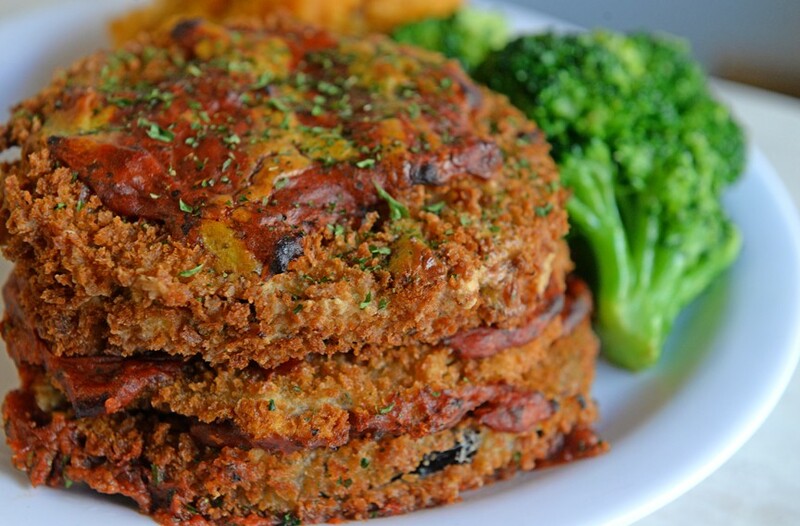 At the counter you'll find lots of similarly brown entrees like vegan lasagna, vegan fried steak, vegan crab cakes and vegan barbecue roast. Next to them are hot and cold sides like okra and tomatoes, vegan mac and cheese, collard greens, red wine kale, a Southern potato or pickled beets. Vegan cookies, cheesecake, pies and other baked goods round out the meal. Everything we tried was flavorful and filling, with recurring notes of ginger, garlic and hot chili sauce. The lasagna satisfied even the meat eaters in our group, with tasty sauce and ricottalike texture. The oriental spinach side was richly redolent of soy and sesame. The ginger spiced tofu was filling and flavorful, with plenty of thick sauce for the brown rice. The chick 'n' drummies are a standout. Each little vegan drumstick is formed around a wooden skewer for that on-the-bone eating experience, and they shred just like real chicken meat. I'll go back just for that with the honey-mustard dipping sauce. 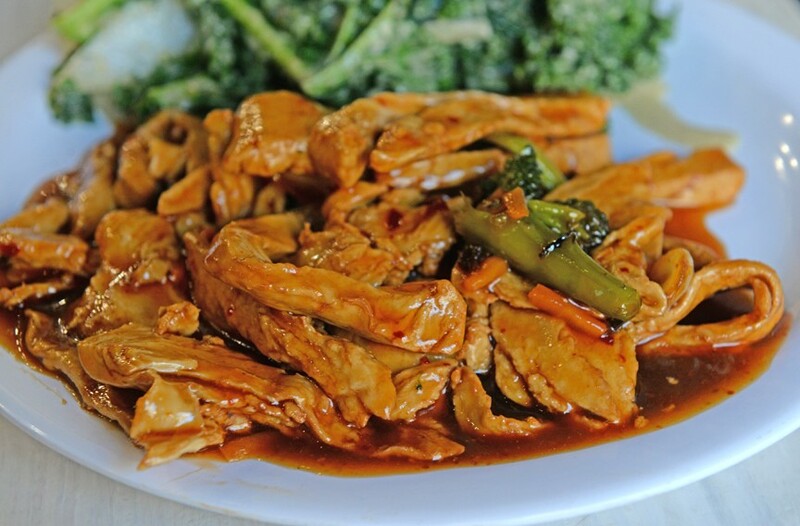 Sesame-ginger “chicken” comes with a side of collard greens. This is counter service, and it's at the very back of the long, narrow space. So are the trash can and busing station. On entering, it's not clear how to order, or where to go. Both times we visited, nobody was helming the juice bar. Ordering is confusing. The wall menu lists items, but none of the food in the display cases is marked. We had to ask the counter servers what everything was, as the line behind us grew, and some of our servers were curt with the descriptions. With so much food on display, we completely overlooked the extensive sandwich menu on one visit. Sandwiches aren't on display. Pro tip: Scan the menu online in advance to decide what to order. Diners order at a walk-up counter at NuVegan Cafe. Although there were many diners eating in both times we visited, this isn't the most work-friendly space. There are plenty of small tables where you could spread out with a laptop, but only one booth, and scarce power outlets. If you did decide to camp out, it seems the staff wouldn't object. We didn't see anyone walking the floor, clearing tables or urging diners out the door. Hard-charging music adds to the hip factor, but we had to raise our voices to have an audible conversation. There are better nearby spots for a working lunch or meeting, but NuVegan is great for a complete change of scenery from the office. Finding on-street parking can be challenging in this busy part of the city, so be prepared to hunt and perhaps walk a block or two. Short lines form, but ordering prepared food moved quickly on our visits. Cooked-to-order items, like the drumsticks, took five to 10 minutes. We had no wait for a table when we visited. We ate in and finished lunch in less than half an hour. Someone ordering takeout could be in and out within minutes, especially if you knew in advance what to order. This could be a reliable takeout or solo eat-in spot for a quick weekday lunch. Every entree item, including sandwiches, is $8.50, with each additional side at $4.50. An entree with two sides is $14. My guest and I each ordered a main and two sides, plus bottled waters, for a total of $39.50 (no tip required). Although that may be a bit pricey for lunch, the portions were large enough for two to share, and we took home plenty of leftovers. Mondays - Thursdays 11 a.m. - 9 p.m.
Fridays - Saturdays 11 a.m. - 10 p.m.
Sundays 10 a.m. - 7 p.m.